By CNN'S PATRICK OPPMANN AND NATALIE GALLÓN REPORTED FROM OUTSIDE TAPACHULA, MEXICO, WHILE DAKIN ANDONE REPORTED AND WROTE THIS STORY IN ATLANTA. CNN'S RAY SANCHEZ, CATHERINE SHOICHET, TAYLOR BARNES, BILL WEIR, SOPHIE TATUM AND MICHELLE MENDOZA CONTRIBUTED TO THIS REPORT. (CNN) - Crowds of migrants resumed their long journey north on Sunday from the Mexican border city of Ciudad Hidalgo, according to Mexican federal police officers. The caravan was headed for Tapachula, a city about 37 kilometers (23 miles) north of the Mexico-Guatemala border, the officers told CNN. There were about 10 buses awaiting migrants along the highway between Tapachula and Ciudad Hidalgo and the drivers had been instructed to carry the migrants to shelters in Tapachula, the officers said. It was unclear how many of the group were from the migrant caravan and how many were Mexicans who joined the march. One migrant, a 20-year-old Honduran named William, told CNN he crossed into Mexico via a float that carried him across the muddy Suchiate River on Saturday. He left home looking for work, he said, and was ultimately bound for either Mexico or the United States, wherever he could land a job. "There is no work back home," he said. "No future." From Friday to Sunday, 1,028 people requested asylum in Mexico, Mexican authorities said Sunday. The government said 346 migrants in "vulnerable" conditions had been transferred to a shelter in the state of Chiapas. In earlier statements, the government said authorities had given "priority attention" to elders, children and women -- some of whom were pregnant. It said there were 2,200 migrants remaining on the bridge connecting Guatemala and Mexico, and about 900 tried to cross into Mexico illegally. The Honduran Foreign Ministry previously said 2,000 people in the caravan had turned around and headed home. Thousands of Central American migrants fleeing poverty and violence were initially prevented from crossing the bridge. On Friday, Mexican authorities began allowing a trickle of migrants, starting with women and children, to pass through the gates and board buses bound for refugee camps. Others pushed through or climbed over a steel gate before riot police stopped them with tear gas and smoke canisters. Some migrants collapsed, coughing or weeping, according to video from the scene. It's unclear exactly how many migrants were allowed to legally cross the border into Mexico, where they were taken to shelters to rest. On Saturday, with the punishing heat bearing down on them, some migrants took matters into their own hands, and crossed into Mexico on rafts that ferried them across the river. One of the migrants marching to Ciudad Hidalgo, Luis Miguel Martinez, 30, also said his goal was to find work in the United States so he could feed his family, including two daughters he left behind in Honduras. He was carrying a pink backpack and a blanket for a woman who also had a small child. But he was happy to help. "We are one group," he said. "One people." The crowd stretched all the way to the horizon. Some carried a Honduran flag, chanting "Mexico. Others hitched a ride, hanging off a tractor trailer headed for Tapachula. It's unclear whether the caravan will be allowed to reach the US border. Mexican authorities previously outlined their plan to respond to the caravan once it arrived at the Mexican border. • Anyone with a valid visa will be able to enter and move freely. • Anyone who wants to be recognized as a refugee or as a beneficiary of "complementary protection measures" must do so individually. Those who do so will be held "at a migratory station" for as many as 45 business days. • Anyone who enters "in an irregular manner" will be "rescued and subject to an administrative procedure and, where appropriate, will be returned to their country of origin in a safe and orderly manner." Mexican authorities also have said they're asking for help from the United Nations High Commissioner for Refugees to process migrants seeking refugee status. The caravan formed October 13 in San Pedro Sula, Honduras, and arrived in Guatemala on Monday. Its slow procession north has prompted US President Donald Trump to threaten to cut aid to Central American nations and to send troops to the US border if Mexico fails to stop the surge. "Full efforts are being made to stop the onslaught of illegal aliens from crossing our (southern) Border," Trump tweeted Sunday. "People have to apply for asylum in Mexico first, and if they fail to do that, the US will turn them away. The courts are asking the US to do things that are not doable!" He followed that tweet with another: "The Caravans are a disgrace to the Democrat Party. Change the immigration laws NOW!" 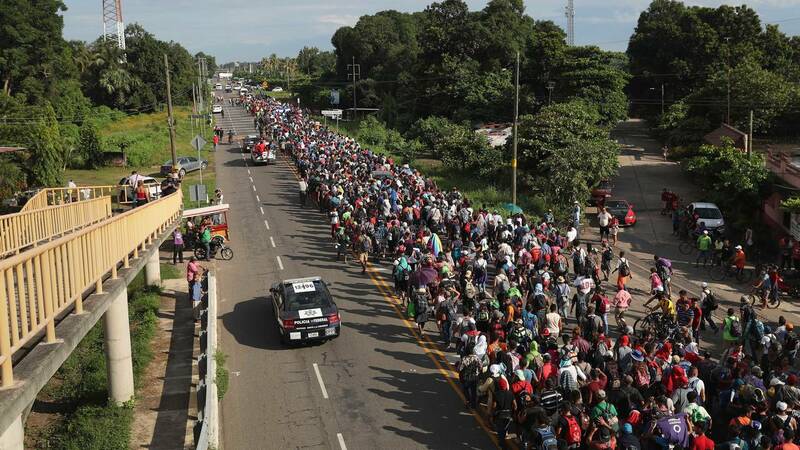 The caravan formed just weeks before the US midterm elections. And many Republican candidates have echoed Trump's rhetoric about boosting border security and cracking down on illegal immigration. The US President has pointed to the caravan as a key issue in the upcoming elections, and has used it to attack Democrats, saying -- without evidence -- they wanted the caravan to arrive before Election Day so the migrants would vote for Democrats. But as asylum-seekers, the migrants would not be citizens and would not be allowed to vote. US Secretary of State Mike Pompeo reiterated that the United States would not allow illegal immigrants entry and said the the government was closely watching the caravan. In a statement Sunday evening, Pompeo warned that "we are concerned that these migrants may be victimized by human smugglers or others who would exploit them. We also are deeply concerned by the violence provoked by some members of the group, as well as the apparent political motivation of some organizers of the caravan." Homeland Security Secretary Kirstjen Nielsen earlier issued a separate statement saying "we must remain mindful" of criminals who try to prey on those participating as the caravan makes its way to Mexico. She said the United States will work with its partners to investigate and prosecute those who try to profit from it.